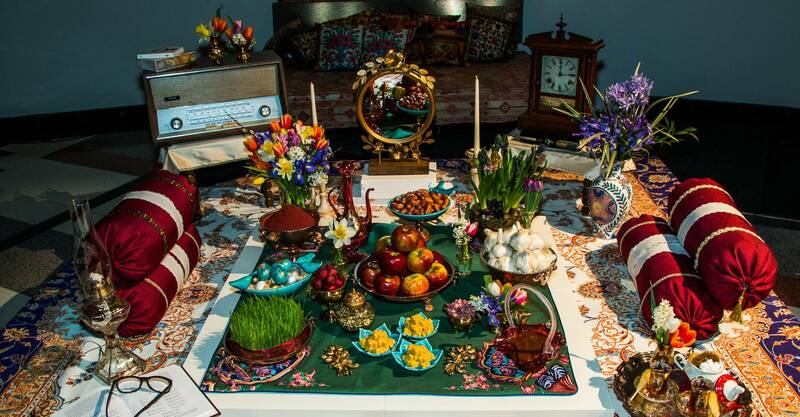 On the actual day of Nowruz, though, you can expect to see a couple of dishes that are specific to the holiday, often centering on greens and herbs to represent its themes of — say it with me now — freshness and renewal. No matter what, though, Iranians will always make you more food than you know what to do with — and at the end of the meal, you’ll still wish you could still eat more. Take a look at Iran’s place on the map and it’s easy to understand why the scope of native foods is so wide. Once the center of the Persian Empire, Iran neighbors the former Soviet Union countries, as well as Afghanistan, Pakistan, the Arab states and Turkey. Although Iran is part of the Middle East, it has close ties to Europe, the Far East, and Africa, owing to its central place on the Silk Road trade route. This stew has the shimmering red-gold color of tomatoes cooked with turmeric, with a sheen of oil on top, a prized characteristic in Persian cooking that shows a stew has been cooked long enough for the oils to rise up. Slightly tart, with the tang of tomatoes, lemon juice, and sometimes the juice of unripe grapes, its tanginess is kept in check by the eggplant, which is first fried on its own until golden-brown, then cooked with onions, lamb and the tomatoes and seasoning. Like all Persian stews, khoresht-e bademjan is thick and meant to be eaten over rice with a fork. Iranians love sour flavors. Like cranberries, barberries have a vibrant red color, but they’re even more sour. This classic rice dish is studded with the red berries, which are dried and then rehydrated before cooking. The rice is cooked with plenty of butter, which helps to soften the intensity of the berries. Quince, rhubarb, green plums, sour oranges, lemons, limes, dried limes, sour cherries, tamarind, sumac and pomegranate are all used in Persian cooking to make food more tart. Tahdig is the soul food of Persian cooking. It’s the crisp, golden layer of fried rice at the bottom of the rice pot, and it tastes like a combination of popcorn and potato chips, but with the delicate flavor of basmati rice. (Tahdig is usually not printed on the menu, so you may have to ask for it.) At Iranian family gatherings, there are always plenty of leftovers, but the one dish that disappears completely is tahdig. It’s eaten as a side dish, and it’s forgivable to pick it up and eat it with your fingers. Abgoosht is one of the most traditional Iranian foods. It is also called Dizi, which refers to the traditional stone crock pots it is served in. Hundreds of years ago Abgoosht was made with lamb and chickpeas. However, later on, when new foods such as potatoes and tomatoes were introduced to Iranian Cuisine, the recipe had some changes. Serving Abgoosht has a special custom. First, the broth is poured in a bowl and served with small pieces of bread soaked in it. Then the remaining ingredients such as potatoes, beans, chickpeas, and lamb are mashed up to a mashed-potato type consistency and served separately alongside with the broth. If you are an eggplant lover, Persian cuisine can be a paradise for you. There are plenty of eggplant dishes and side dishes in Persian cuisine, and among them one of the most popular dish is Kashke Bademjan. The main ingredients of this dish are eggplants and Kashk which is a type of yogurt whey. In the process of making cheese, the remaining liquid after milk has been strained is called whey. Kashke Bademjan is often served with a special Persian bread called Lavash, but you can serve it with pita bread or crackers too. Tahchin is a popular Iranian rice dish of saffron-infused rice layered with a kind of meat (or vegetable), yogurt and eggs. There are different kinds of Tahchins based on the ingredient which is layered with rice. The most popular Tahchin among Iranians is made with shredded chicken, and the other kinds such as beef, spinach or eggplant Tahchin are not widely known. The word Tahchin literally means “placed at the bottom” and refers to the rice layer placed at the bottom of the dish, which results in a crunchy outer crust. Haleem or Halim is a thick, delicious and high-calorie porridge popular in the middle east and central Asia for centuries. It is also known for some other names such as Harees/Hareesa, Keshkek, Kichara or Daleem. The origin of Haleem is not definite. But, it is a star of Arabian, Turkish, Persian, Pakistani, Bengali and Indian cuisine. Even though the recipe slightly changes from one region to another, it always includes wheat and meat. People use different forms of meat (lamb, beef, turkey or chicken breast) to cook it. This recipe that I am sharing here is the Persian Haleem, that is typically served for breakfast or during Ramadan month. This dish is slow cooked for some hours which results in a paste-like consistency.